Tim comes in to give all the Patreon members their questions answered. But let's make this for all people. Sign up to get episodes like this one down below. -Join DHH PATREON!! 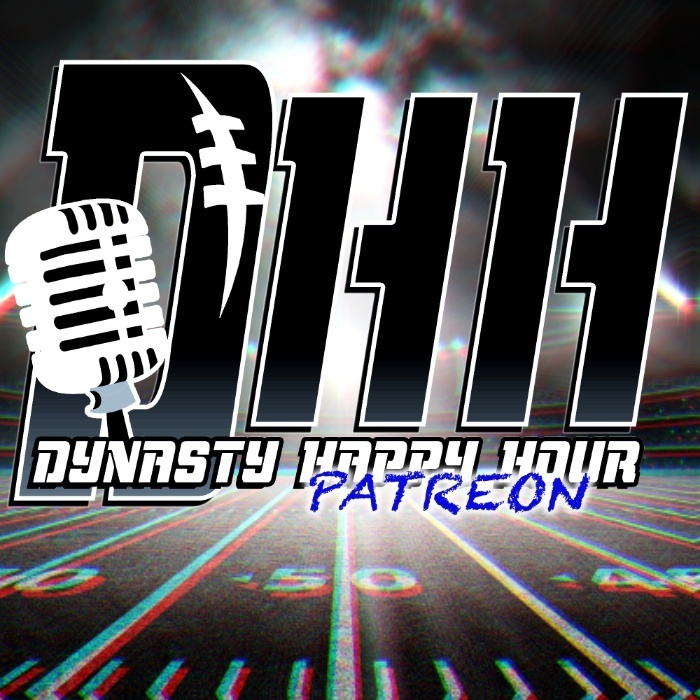 Go to www.patreon.com/DynastyHHPod and check out the different tiers of patrons you can be. Ranging from 10%-25% off DHH store, giveaways, and an extra patreon listener question episode where you get your questions answered live or read. -Check out, or click this link, trophysmack.com to get your new league trophy today!! When you do, use code DHHRING to get a $60 championship ring FREE with your trophy. Just add the ring to your trophy and during checkout the ring will be taken off. -MyFantasyLeague.com Only the best hosting site for dynasty leagues....hands down! NEW HATS AND DEVY HAPPY HOUR SHIRTS!!!! Want to support the guys? DHH public rankings up on site! Rookie crushes for the guys! Patreon So Good… We Made it Public! We usually keep Patreon hidden for the members. But this week was just too good to hold back. This is what you would get if you become a memeber of our amazing Patreon! We called in the lefty... Justin is filling in for Tim this week as the fellas go over what they are watching for at the NFL Combine this week. Players that will get hype that you need to settle down on, guys that need to perform, and much more! Tyler is back and him, Doug, and Tim go over 25 players 25 and under that will make a jump in 2019! A special episode on the day of love. To all of our devy lovers! Tyler is out for this last week, but we give you something you have all asked for... finally.... a 2 round, 12 team, superflex rookie mock draft! -Check out, or click this link, fantasychamps.com to get your new league trophy today!! When you do, use code DHH to get a 10% off championship ring, trophy, belts, and custom team jerseys to rep your own fantasy team! Dwight and Andrew are back! This time they brought a friend from the Stick 2 Football podcast in Connor Rogers! Hold onto your seats, because this is a good one! With Tyler out for 3 weeks due to work; Doug, Tim, and Justin take over the joint and talk about the 2019 NFL free agents. They go over some landing spots they could see happen. Episode 1 is here and Dwight and Andrew bring the heat! Andrew talks about his time at the Senior Bowl and what he learned while he was there. This week Justin, Tim, and Tyler go over some strategies on how to approach a startup dynasty draft. How to go about trades and how to let the board fall to you. With Tim out this week, we bring on the new "reliever", Justin McCasland! Doug, Justin, and Tyler are joined by the PT himself, Matthew Betz, to talk about players who have had significant injuries and if we should be worried about them in 2019.